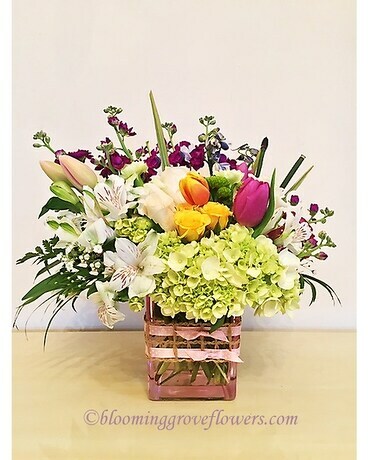 Seasonal Designer choice: yellow spray roses, white roses, green hydrangea, purple stock, blue delphinium, 'young' bi-color tulips, purple tulips, peruvian lilies, fillers and greenery, are delivered in a clear glass vase, decorated with ribbons. Approximately 9" W x 12" H Flowers and Containers subject to change based on season and availability. However we will create something similar. Please call to discuss.